Detailed and comprehensive Traditional Thai Massage training apprenticeships in Foundations, Advanced, and Therapeutic Thai Massage bring the most authentic and traditional style of training to the student. Thai Massage trainings are intensive and teach students think for themselves and practice Traditional Thai Ayurveda based treatment protocols at the therapeutic level rather than learning fluffy, stretching focused, repetitive entry level technique. Unlike massage and or massage therapy programs, students are learning a comprehensive and traditional system of indigenous traditional medicine from day one and have the opportunity to study one-to-one with the instructor: Our Florida State Authorized College of Natural Medicine and Ayurveda and the Thai Yoga Center are located in beautiful Brooksville, Florida.learning in a traditional Thai-style apprenticeship through watching, practicing, and immersion style format is the most focused and intensive way of learning. Our SomaVeda® Thai Yoga programs are famous world wide and our program is the oldest original Traditional Thai Medical Massage program in the US, full time since 1984! Other programs claim to be traditional and to stress a traditional Thai style approach. However the student should ask upon what traditional apprenticeship and authentic traditional school method is their approach based on? Our chief instructor Aachan, Dr. Anthony B. James is recognized as a master teacher and professor of Thai Traditional Medicine by The UTTS, Ministry of Thai Traditional Medicine and is a Certified Aachan and professor in the Anantasuk School of Thai Traditional Medicine and the Wat Po Association of Thai Traditional Medical Schools. See verifiable references here! If any instructor claiming to operate a “traditional ” apprenticeship type of program approaches you and can not provide similar or equal documentation… Run Away! We offer over 4000 hrs. of college level education & courses, certifications and degrees in our apprentice program. No other Traditional Thai Massage program offers so much. New apprentice students begin with the 164 hr. 17 day intensive training… Typical course days run from 8:30 am in the morning to 10:00pm in the evenings. When we say intensive training. we mean it! Click here for a complete description of the pre-requisite course for new apprentices and students! More than intensive, personal, hands on professional training and education. As we are a NAIC (Native American Indigenous Church) operated seminary we are not doing this for the money! 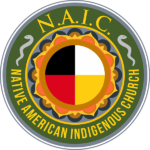 NAIC Inc. is a Florida State Chartered, IRS Compliant 508 (c)1(A) FBO- Faith based, religious/ Church and Federally registered Tribal Organization. This means not only are donations to NAIC Tax Deductable but that NAIC offers the MOST Generous Tuition Grant and scholarship program in the industry. See for yourself how we can generously offer five different Tier Level Grants. SCHOLARSHIP-GRANTS FOR NEW STUDENTS. Unlike other so called traditional schools, we represent living traditions of Ayurveda and Thai Traditional Medicine with verifiable permission and authorization. Our Aachan is recognized as an Aachan or Professior of Thai medicine and has the verifiable recognition’s to prove it! Aachan, Dr. Anthony B. James Bio. 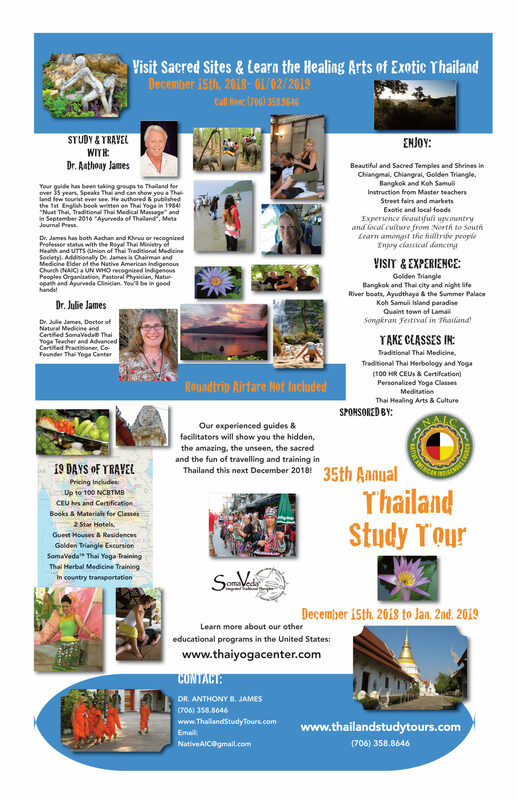 No one better here in the US or in Thailand to teach you this traditional healing work than a Thai recognized master teacher with 36 years of full time teaching experience teaching Thai Medicine and traditional healing arts. ​​​There is more than technique involved in running a healing practice and making a living as a Traditional Thai Massage practitioner! Since our school is a full and comprehensive natural medicine and college of Ayurveda we can teach you everything you need to start, maintain and prosper in your Traditional Thai Massage based healing practice. More than 27 distinctive adjunct and clinical practices are offered to every apprentice. Of course included at NO Additional Fee! The full apprentice style program will take an average student two to four years to complete (with a SCNM College degree) however, the initial commitment is only 17 days. The student is expected to practice and do the required homework between modules to assimilate and absorb all the instruction. Aachan, Dr. Anthony James and senior staff teachers make sure you stay on track. What’s the point of apprentice in a genuine traditional Thai Massage program if your not legal to practice everything you have learned! We can assure you that when you complete our program and following our legal guidelines as taught in class your perfectly legal to practice in all 50 states and 100 countries outside the US! Most if not all programs of study calling themselves “Thai” regardless of how good their technique is can not give you a legal basis to actually practice! We are a Federally Registered Native American Indigenous Tribal Organization and our right to practice our religious therapeutics is established and protected under two different federal codes. Some school try to mis-direct students into enrolling in Massage Therapy programs and applying for a massage license to practice… Falsely implying that your legal to practice Traditional Thai Massage with a “Massage License”… This is patently false and misleading and unethical as well. These schools are not going to be able to offer you any assistence should a massage board or state medical board come after you! We can provide a legal basis for practice to all of our apprentices upon request. Listen to first hand Testimony from our SomaVeda® Thai Yoga Therapy and Ayurveda Apprentice Students! New Apprentice Start Dates: January, March, May, July, September, November and December and April in Thailand!